Published in the South Kent Gazette, 20 June, 1980. In 1836, at the time of the enquiry as to the condition of Dover Harbour, the Commission and principal officers were the Duke of Wellington (Lord Warden), R. H. Jenkenson (Lieutenant-Governor of the Castle), Edward Pett Thompson (Mayor), Sir Henry Oxenden, W. O. Hammond, Sir Edward Knatchbull, Sir J. H. Brydges, the Earl of Guilford, P. J. Plumptre, MP, Sir Brook Brydges, P. E. Morrice, John Shipdem (Register), James Walker (Engineer), and John Iron (Harbour Master). The new Board, as constituted in 1861, consisted of Viscount Palmerston (Lord Warden), Capt J. W. Noble (Admiralty), S. M. Latham (Board of Trade), John Birmingham and J. C. Ottaway (Town Council), W. G. Thomson (S.E. Railway), G. P. Holroyd (L. C. and D. Railway), James Stilwell (Register), Rowland Rees (Engineer), Richard Iron (Harbour Master). The present Board consists of Sir William Crundall (Board of Trade) (Chairman), Admiral Rice (Admiralty), W. W. Burkett and W. J. Barnes (Town Council), Right Hon George Wyndham, H. O. Cosmo Bonsor, and Vincent W. Hill (Railways), Martyn Mowll (Register), A. T. Walmisley (Engineer), and Capt John Iron (Harbour Master). Mention should be made of the pre-Victorian dream of a landing jetty, to accommodate the Continental-traffic. It was first proposed in 1834, about the same time that the South-Eastern Railway was projected; but it was not until 1837 that notice was given of an intention to apply to Parliament for powers. After that, the Jetty movement subsided until 1843, when it was decided to proceed with the work forthwith, as a counter stroke to the harbour works which were then being pushed forward by the South-Eastern Railway at Folkestone. Again the project was left in abeyance, but about the close of 1844 the Railway Company offered to subscribe for £3,000 of the share capital. Even that did not make things move, and in 1846 the Dover Town Council sent a memorial to the Harbour Board asking them to provide a jetty to enable steamers to land and embark passengers at low water. The Harbour Board, admitting that such a provision was necessary, frankly stated that they had no money wherewith to build one, therefore the Town Council petitioned the Admiralty to provide a landing jetty as part of the National Harbour, which was then under consideration. Even then the people of Dover hung on to the project. 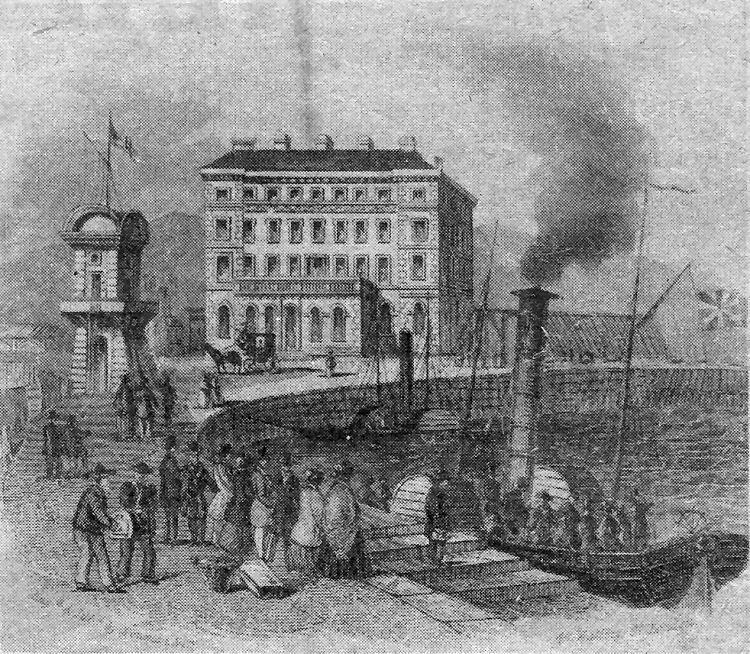 The Jetty Company, in September 1847, reported that the whole of their capital, £8,000 had been subscribed, and orders were given to prepare plans and specifications, the Company having received a promise of £350 a year from the British Government for a mail service, and £250 a year from the Belgian Government. On the 25th of September, 1847, the first pile for the landing jetty was driven opposite Waterloo Crescent, and on the same date the contractor commenced his preliminary work for building the Admiralty Pier. A few months later, a meeting of the. 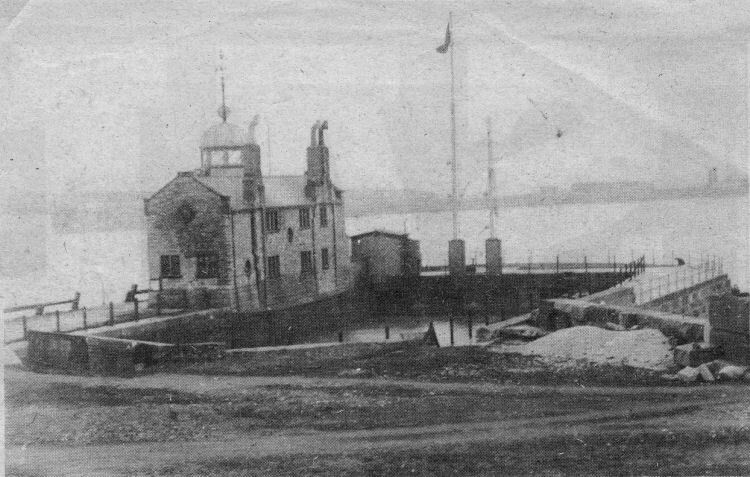 Jetty Company was called, when it was stated that owing to a proposed deepening of the inner harbour, so as to admit steamers at low water, the jetty would not be needed, therefore it was decided to call up £1 per share of the capital to pay expenses, and the project was abandoned. The deepening of the harbour was a dream also, but ultimately the Admiralty Pier provided the accommodation required. The old sluice near the site of what is now the Train Ferry Dock. It was one of the devices employed by engineers to try and cope with the problem of the silting up of the old harbour mouth between the North and South Piers. It was allowed to fill with water which, when released, rushed out and cleared away some of the build-up of silt and shingle. Overlooking the sluice is the old Customs look-out which still survives. Above is an attractive engraving of the Lord Warden Hotel and the old pilot tower. A panoramic view of Dover bay drawn by the Dutch artist Antony van den Wyngaerde between 1554-58. It shows in the foreground part of the works carried out by Thompson who had a grandiose scheme to improve Dover Harbour and save Paradise Pent from oblivion. His works, which failed, were near the present entrance to the tidal harbour. For many years the jetty and Crane Pier nearer the shore formed the only harbour that Dover knew for a number of years. They protected an area which came to be known as the Bight, which was well protected from the south-west and fairly well from the north-east winds. As many as 200 ships are said to have found shelter there but eventually Thompson’s works caused a build-up of shingle which crippled the haven.